A mysterious white evaporate or precipitate was found in Runkle Canyon by Rev. John Southwick and Frank Serafine on March 26, 2008 and given the next night to Norm Riley, Rocketdyne cleanup Project Manager for Cal-EPA’s Department of Toxic Substances Control (DTSC) which subsequently tested the stuff. More of this evaporate was collected June 10, 2008 and a sample was sent out for additional analysis of the chromium valence ratio and additional tests to “fingerprint” the material, if possible. Those results won’t be available until early July 2008. The heavy metal numbers derived from just this one sample are revealing and suggest additional sampling and testing should occur including analysis of other potential chemicals of concern. In the DTSC report, it states that “Jose indicates white precipitate is an evaporative salt,” in comments made two weeks before the test results came back. 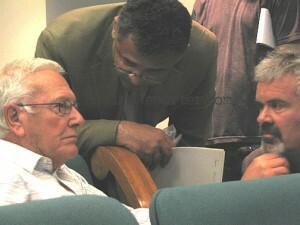 Southwick, DTSC's Norman Riley and "Fearless Frank" Serafine confer March 19, 2008. That very well may be true. But the test results, and the actual look of the white precipitate, indicate that this may be a widespread distribution of heavy metal contamination that could threaten the groundwater supply of Simi Valley. The data also suggests that there may be threats to human and animal health due to chromium exposure from this evaporate/precipitate. Comments made by a DTSC official in June also suggest that this same “evaporative salt” is also surfacing in Dayton Canyon, which is miles away from Runkle Canyon in the western San Fernando Valley. The DTSC results were compared to data found in a report called “Background Concentrations of Trace and Major Elements in California Soils.” This March 1996 Kearney Foundation of Soil Science special report was authored by personnel from the Department of Soil and Environmental Sciences, University of California, Riverside, and DTSC. Several of the heavy metals in the white rocks collected by the Radiation Rangers, and tested by DTSC, were significant. The samples noted below show that this apparent “evaporative salt” contained just 14 percent more sodium, or salt, than average California soil, but the potassium is over 635 times normal. Potassium is similar to sodium but not a salt though it is used as a salt substitute for people who have to monitor and reduce their high blood pressure. While the calcium content is a negligible 31 percent higher than normal, nickel is early 11 times average, molybdenum over 14 times and iron 3,243 times its average concentration in state soil. 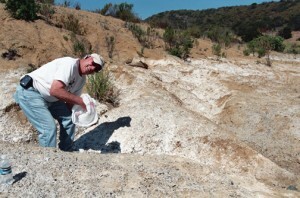 "The Good Reverend John" Southwick collects white precipitate in Runkle Canyon on June 10, 2008. 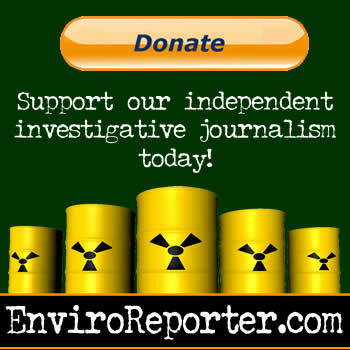 The chromium reading of 1,300 mg/kg is over six times the Region 9 — U.S. EPA “preliminary remediation goal” for the heavy metal in soil, a level where no more than one in a million cancers human cancers will manifest from a pollutant. This Runkle material also nearly eleven times normal chromium concentrations in the state. Chromium occurs in the environment primarily in two valence states, trivalent chromium (Cr III) and hexavalent chromium (Cr VI). Exposure may occur from natural or industrial sources of chromium. Chromium III is much less toxic than chromium (VI). The respiratory tract is also the major target organ for chromium (III) toxicity, similar to chromium (VI). Chromium (III) is an essential element in humans. The body can detoxify some amount of chromium (VI) to chromium (III). The respiratory tract is the major target organ for chromium (VI) toxicity, for acute (short-term) and chronic (long-term) inhalation exposures. Shortness of breath, coughing, and wheezing were reported from a case of acute exposure to chromium (VI), while perforations and ulcerations of the septum, bronchitis, decreased pulmonary function, pneumonia, and other respiratory effects have been noted from chronic exposure. Human studies have clearly established that inhaled chromium (VI) is a human carcinogen, resulting in an increased risk of lung cancer. Animal studies have shown chromium (VI) to cause lung tumors via inhalation exposure. Establishing chromium standards has been the subject of fierce debate especially since the film Erin Brockovich which centered on the discovery of hexavalent chromium in the groundwater of the tiny California town of Hinckley. Indeed, Cr (VI) has fouled the groundwater underneath the eastern part of the San Fernando Valley including the cities of Burbank and Glendale. The city of Simi Valley’s August 14, 2007 Tetra Tech analysis of samples drawn from Runkle Canyon surface water found chromium 20 percent higher than the state’s “maximum contaminant level” for tap water. While Runkle’s water is not directly consumed, except by wildlife and when cattle graze there, it does flow downhill into the Arroyo Simi aquifer under the city and then blended with imported water, making up about 20 percent of the mix of what comes out of Simi taps. The relative amounts of trivalent and hexavalent chromium in the Runkle Canyon white evaporate have not yet been determined. The total chromium reading of 1,300 mg/kg is nevertheless very informative, especially when comparing it to other state’s and nation’s standards that do not exist in California presently. Not all states have chromium standards but the ones that do suggest that 1,300 mg/kg is a considerable amount of total chromium. New Jersey’s Soil Action Level for chromium is 100 mg/kg, which the Runkle Canyon sample exceeds by a factor of thirteen. The Soil Action Level for nickel is also 100 mg/kg which the Runkle sample exceeds by more than six times. New York’s objective for total chromium is 10 mg/kg (or background) meaning the Runkle evaporate is 130 times that. Kentucky’s objective for total chromium is 21.3 mg/kg (or background) meaning that the sample is 61.03 times that. Oregon’s soil cleanup levels are expressed as leachate reference concentrations. That state’s goal for total chromium is 10 mg/kg. The maximum allowable amount of chromium for residential soil is 1,000 mg/kghe which the Runkle Canyon sample exceeds by 30 percent. “Canadian Soil Quality Guidelines for the Protection of Environmental and Human Health – CHROMIUM: total chromium 1997/ hexavalent chromium (VI) 1999” is a set of standards that for land use scenarios, both agricultural and residential/parkland are 64 mg/kg. The Runkle Canyon chromium reading is over 20 times this Canadian limit which also is the same for direct soil contact scenarios. The impacted area is not fenced making contact by hikers and pets possible.